Technical drawing of ASME B16.5 weld neck flanges 150LB. The typical drawing of weld neck flanges 150LB with raised face. Dimension and weight specifications of ASME B16.5 Weld Neck flanges 150LB. (1) 150LB refers to Class 150 which is one of the pressure ratings stipulated by ASME B16.5. 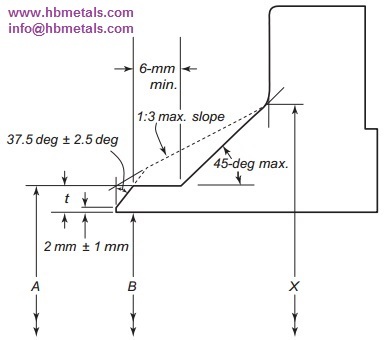 Dimensions D, B, t and H refer to the basic flange dimensions: D – outside diameter of flange, B – bore diameter of weld neck flange, t – minimum thickness of flange, H – length through hub of weld neck flange. n, L and K refer to the bolting drilling dimensions of flange: n – number of bolts, L – diameter of bolt holes, K – diameter of bolt circle. G denotes the outside diameter of raised face. A and X are dimensions associated with the hub: A – diameter at the top of hub, X – diameter at the root of hub. A is the same as the nominal outside diameter of the pipe connected to the flange. (2) Usually two types of welding ends can be furnished according to different wall thickness of the pipe. The bore diameters of weld neck flanges 150LB correspond to the inside diameters of pipe as given in ASME B36.10 for standard(STD) wall pipe. Thickness of standard wall is the same as SCH40 in sizes 10″ and smaller. These bore sizes are furnished unless otherwise specified by the purchaser. Besides, bore diameters of 14″ and larger shall be specified by the purchaser. Ring joint facing (RTJ) is also available upon request. All tolerances shall be in accordance with ASME B16.5. 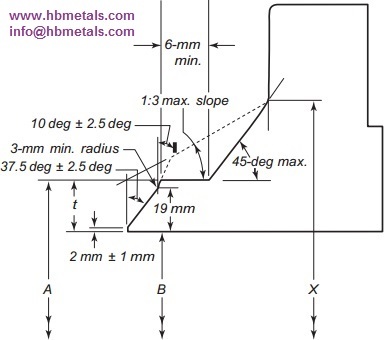 (3) All dimensions are provided in both metric and imperial units except for the bolt hole dimensions. Each value of the two systems shall be used separately. The welding ends of weld neck flanges for wall thickness 5 mm < t ≤ 22 mm. The welding end of weld neck flanges for wall thickness t > 22mm. Dimension A denotes nominal outside diameter of the pipe while B denotes nominal inside diameter of the pipe. The t and X respectively represent nominal wall thickness and the diameter of hub of the weld neck flange. 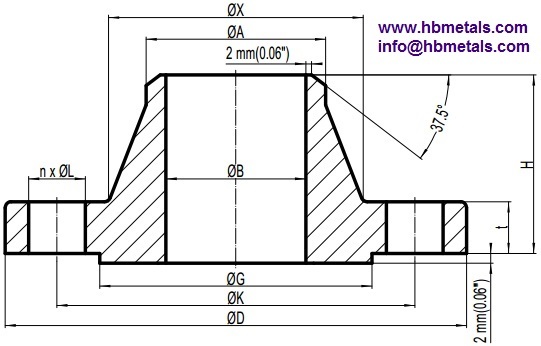 When the thickness of the hub at the bevel is greater than that of the pipe to which the welding neck flange is joined and the additional thickness is provided on the outside diameter, a taper weld having a slope not exceeding 1 to 3 maybe used, or alternatively, the greater outside diameter may be tapered at the same maximum slope or less, from a point on the welding bevel equal to the outside diameter of the mating pipe. Similarly, when the greater thickness is provided on the inside of the flange, it shall be taper-bored from the welding end at a slope not exceeding 1/3. When ASME B16.5 flanges are intended for services with light wall, higher strength pipe, the thickness of the hub at the bevel may be greater than that of the pipe to which the flange is joined. Under these conditions, a single taper hub may be provided. The additional thickness may be provided on either inside or outside or partially on each side, but the total additional thickness shall not exceed 1.5 times the nominal wall thickness of intended mating pipe. Besides, the hub transition from the A diameter to the X diameter shall fall within the maximum and minimum envelope outlined by the 1:3 max slope and solid line. The 6-mm length is the minimum dimension applies only to the solid line configuration. ASTM A182 F5 flanges are forged flanges manufactured from a chromium-molybdenum low alloy steel know as 5Cr-0.5Mo with a UNS designation of K41545. They are widely utilized in pressure high-temperature services such as oil refineries, chemical and petrochemical industries, power plant piping, heat exchangers, and various pressure vessels. The chromium (Cr) added in F5 not only increases resistance to abrasion and corrosion but also improves resistance to high-temperature hydrogen attack and graphitization. The molybdenum (Mo) content is acting as a grain refiner which enhances creep resistance and high-temperature strength. It also improves resistance to pitting corrosion in many environments. The creep strength of chromium-molybdenum low alloy is derived mainly from two sources: solid-solution strengthening of the matrix ferrite by carbon, molybdenum and chromium as well as precipitation hardening by carbides. As a result, the creep strength (for 1% elongation in 105 hours) of A182 Grade F5 may reach approx. 170 MPa at 450 °C. Mechanical requirements and heat treatment. According to ASME B16.5, pipe flanges manufactured from A812 Gr. F5 material shall be normalized and tempered at a temperature higher than 955 °C (1750 °F). The material is permissible but not recommended for prolonged use above 590 °C. Pressure-Temperature ratings for ASTM A182 F5 flanges. 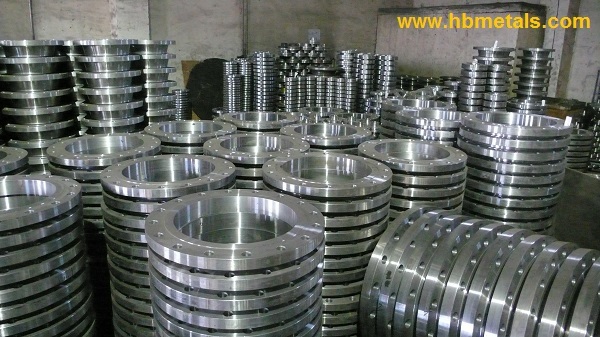 Various types of flange facing. According to ASME B16.5, there are several types of end flange facing which shall be calculated and selected carefully to ensure a leak-free seal. Figures A and B show the most common flange facing of raised face. 2 mm raised face is regularly furnished on Class 150 and Class 300 while 7 mm raised face is furnished on Class 400, Class 600, Class 900, Class 1500 and Class 2500. Figures C, D, E, F, G, H respectively illustrate the facing type of large or small male face, large or small female face, small male face(on end of pipe), small female face(on end of pipe), large or small tongue face, and large or small groove face. Figure I is the typical drawing of ring joint face which is also a prevalent flange connection requiring a metallic ring either in oval or octagonal shape. 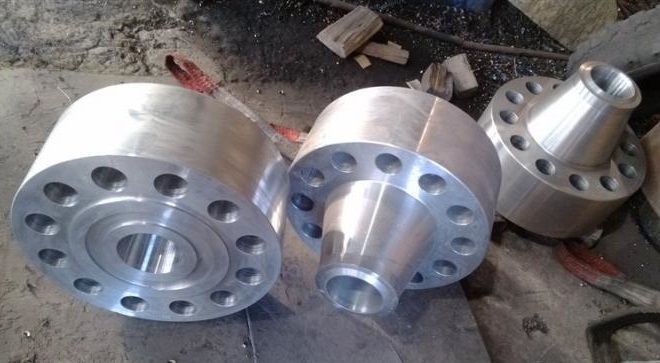 In the case of flanges having raised face, tongue, or male face, the minimum flange thickness tf, shall be provided, and then the raised face, tongue or male face shall be added thereto. 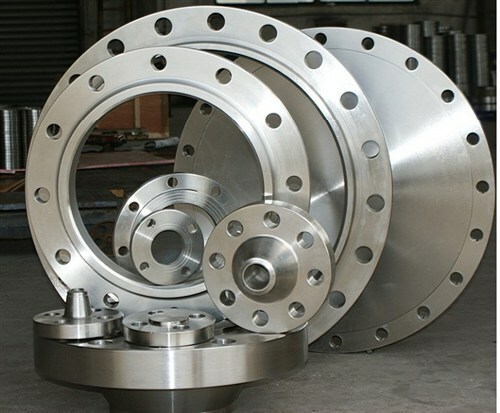 For flanges that have a ring joint, groove, or female face, the minimum flange thickness tf shall first be provided and then sufficient thickness added thereto so that the bottom of the ring joint groove, or the contact face of the groove or female face, is in the same plane as the flange edge of a full thickness flange. Flat faces are usually used in cast iron flanges such as AWWA flanges in water supply service. 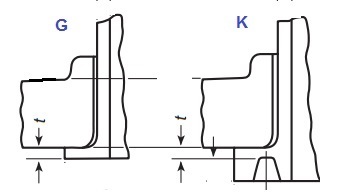 However, lapped joint flanges shall be furnished with flat face (FF) as illustrated in figure G and K. The stub ends can be provided with raised face or ring joint face in similar function. Surface finishes of flange facing. The raised face or flat face shall be furnished with a serrated concentric or serrated spiral finish having a resultant surface roughness from 3.2μm to 6.3μm. The cutting tool employed should have an approximate 1.5 mm or larger radius, and there should be from 1.8 grooves/ mm through 2.2 grooves/ mm. The side wall surface roughness of the ring-joint gasket groove shall not exceed 1.6μm. For groove, tongue and small male and female, the gasket contact surface finish shall not exceed 3.2μm roughness. Incoloy 800 flanges (pipe flanges) refer to forged flanges manufactured to ASTM B564 according to the dimensional standards of ASME B16.5. Incoloy 800, also known as Alloy 800 or UNS N08800, is an iron-nickel-chromium alloy with good creep & stress-rupture strength and excellent resistance to oxidation, sulfurization and carburization in high-temperature services. It also resists corrosion by many aqueous environments. The forged Incoloy 800 flanges can be used in applications with temperatures up to 816°C while maintaining a stable, austenitic structure during prolonged exposure to high temperatures. The material is widely utilized in processing piping, heat exchangers, heating element sheathing, petrochemical pipeline(especially for heavy oil) and nuclear power plant, etc. Incoloy 800 weld neck flange, RTJ, API 6A. *All the forged Alloy 800 flanges shall be annealed. 3. Chemical composition requirements for Incoloy 800 (UNS N08800). *Chromium additions improve sulfidation resistance while aluminum and titanium allow strengthening through precipitation hardening (age hardening). Nickel content not only improves the fatigue strength and high-temperature performance(especially in reducing environments) but also inherently resists to reducing corrosion, both acid and alkali. Thus, Incoloy 800 has better resistance to reducing corrosion than common austenitic stainless steels. 4. Mechanical requirements for Incoloy 800 forgings. *The forgings shall take ultrasonic test or liquid penetration inspection. Liquid penetration inspection is not applicable to forgings with hot finished surface. ASME B16.5 flanges in stock. 1. ASTM A105 forged carbon steel flanges. ASTM A105 is the standard specification for carbon steel forgings for piping applications including flanges, fittings and valve parts, etc. According to ASME B16.5(Pipe Flange), this material is categorized into Group 1.1 which has the same pressure-temperature ratings as ASTM A216 Grade WCB, A515 Grade 70, A350 Grade LF2, A516 Grade 70, A350 Grade LF6 Class 1, A537 Class 1 and A350 Grade LF3. ASTM A105 flanges refer to forged carbon steel flanges for ambient and high temperature service in pressure systems.They can be manufactured to dimensional standards of ASME B16.5, ASME B16.47, MSS SP 44, API 605, BS 4504, EN1092-1 and L-005, etc. 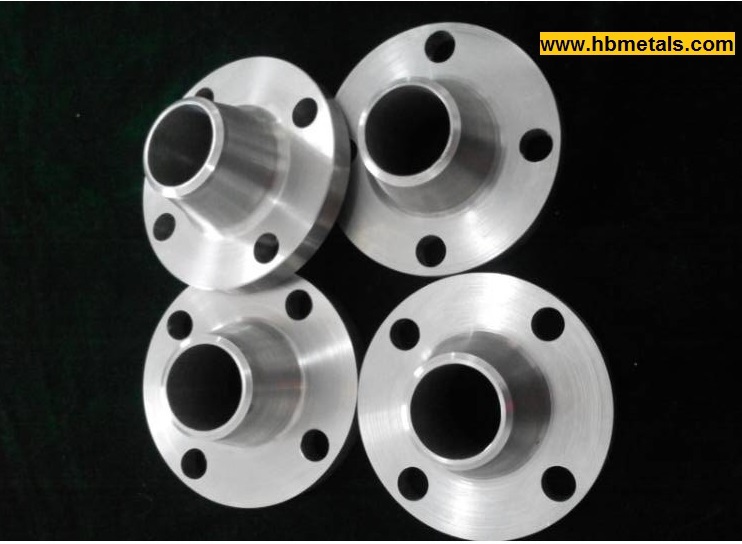 HBMetals keeps a large amount of flanges available in stock covering flange types of welding neck, slip on, socket welding, threaded, blind, slip on plate, long weld neck, orifice and lap joint, etc. 2. Chemical composition, mechanical properties and pressure-temperature ratings for ASTM A105 flanges. *The sum of copper, nickel, chromium, molybdenum and vanadium shall not exceed 1.00% while the sum of chromium and molybdenum shall not exceed 0.32%. The carbon equivalent CE = C + Mn/6 + (Cr + Mo + V)/5 + (Ni + Cu)/15 shall be no larger than 0.47 based on heat analysis. *Unless otherwise specified by the customer, heat treatment is not a mandatory requirement for 150LB and 300LB A105 flanges. However, flanges above Class 300 (Class 400, 600, 900, 1500, 2500) or custom-design special flanges shall be furnished with one of the following heat treatment: 1) annealing, 2) normalizing, 3) normalizing and tempering, 4) quenching and tempering. *ASTM A105 flanges are not recommended for prolonged use above 425°C since upon prolonged exposure to temperature above 425°C, the carbide phase of steel may be converted to graphite causing brittleness problems. Inconel 600 flanges are forged flanges made from Inconel 600 forgings in accordance with ASTM B564. Inconel 600 is a nickel-chromium-iron alloy which has a nominal designation 72Ni-15Cr-8Fe as well as UNS N06600. These flanges(also called “Alloy 600 flanges”) are widely used in oil & gas projects and chemical processing industry due to its excellent resistance to oxidation at high temperatures and resistance to cracking corrosion and caustic corrosion. ASME B16.5 stipulates the pressure-temperature ratings for Inconel 600 flanges which should be furnished in the heat-treatment condition of anneal. Inconel 600 Weld Neck Flange RF 2″ 150LB SCH80 supplied to US. 1. Technical drawing of MSS SP 97 full type weld outlets XXS. The technical drawing for weld outlet XXS full type according to MSS SP 97. 2. Dimension and weight specifications of MSS SP 97 weld outlet XXS full type. 1. The bevel end of the weld outlet XXS full type shall be furnished in accordance with ASME B16.25. “Full Type” indicates that the diameter of the branch outlet is the same as that of the run pipe. 2. The wall thickness XXS(Double Extra Strong) shall be in accordance with ASME B36.10. 3. The full type weld outlet XXS has the same dimensions as the full type WeldOlet SCH160 except for wall thickness. 1. Technical drawing of MSS SP 97 reducing type weld outlets XXS. The technical drawing for reducing size Weld Outlet XXS according to MSS SP 97. 2. Dimension and weight specifications of MSS SP 97 weld outlets XXS reducing type. 1. The bevel end of the weld outlet XXS reducing type shall be furnished in accordance with ASME B16.25. “Reducing Type” indicates that the diameter of the branch outlet is smaller than that of the run pipe. 3. The reducing type weld outlet XXS has the same dimensions as the reducing type WeldOlet SCH160 except for wall thickness.